POINT REYES NATIONAL SEASHORE, Calif. -- A turtle usually found in warmer waters much farther south caught spectators off guard Tuesday at Point Reyes National Seashore in Marin County, according to officials with the Turtle Island Restoration Network who said El Nino could be a factor. Visitors watching for elephant seals saw the olive ridley sea turtle at about 2:30 p.m. at the Lifeboat Station at Chimney Rock. Olive ridley sea turtles are normally found thousands of miles south of the Bay Area, off the coast of southern Mexico and Costa Rica, officials with the network said. "This olive ridley sea turtle is way out of its normal range, and while what it was doing here will remain a mystery, it is probably due to the warm water El Nino conditions occurring in the Pacific," Turtle Island Restoration Network biologist and executive director Todd Steiner said. 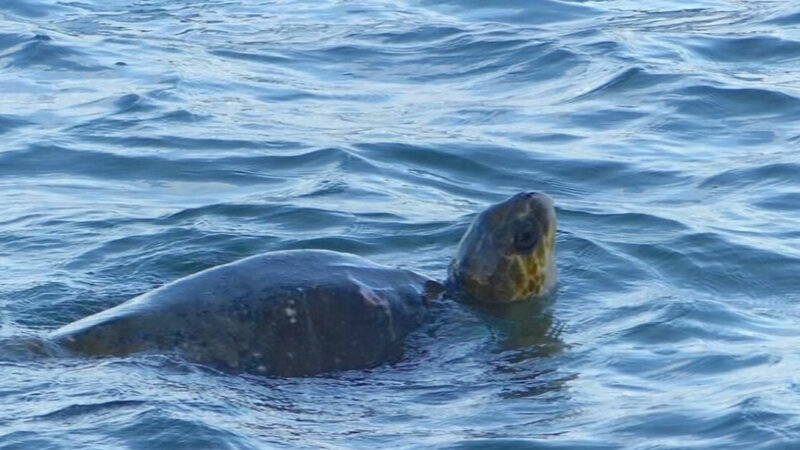 Other sightings along the Pacific Coast have been of dead turtles, network officials said. Two were seen in California, two in Oregon, one in Washington and three in Alaska. David Ford, a member of the Turtle Island Restoration Network, was among the people to see the turtle. "The sea turtle was paddling around about 20 feet off shore, then it finally headed out, dove down and disappeared," Ford said. "It was sharing the area with juvenile elephant seals and surf scoters," a large sea duck, he said. He said the turtle looked to be healthy and was reported to have a shell of about three feet in length.